Martel is old wives tale lar. Don't seem to be true. I tried for 6 months and still don't see any hair growth. Probably depends on genes as well. I have this female friend who's a freelance cosmetic seller. She's currently selling honey products which includes facial and hair tonics. To be applied and not edible. Wondering whether I should give them a try or not. Ohh okay. I thought you have all the products. Like I spray the superhard type? Gatsby superhard. Is there different between the upper and lower floor? I feel like going to have hair cut again.. I think after two weeks. My hair become long and cannot handle. Wah you fiercer than me. I 3 weeks cut once, you 2 weeks. Sorry for your wallet. Pekcek sia.. My hairstyle sort of drop down. Now look like siao Gina. Because my hair supposed to be all comeback. But my long hair stubborn and want to yank out. It seems like it's not I want anymore. Normally I cut my hair after 4weeks.but I think I need to cut shorter abit. 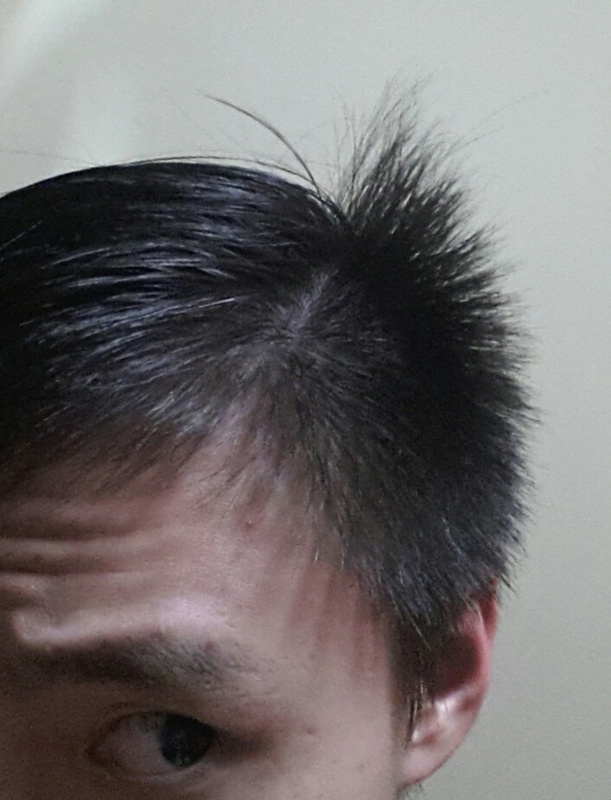 If not really heavy sia.. My fringe comb back can touch my crown sia. Because my hair supposed to be all comeback. But my long hair stubborn and want to t**** out. Cut short and let it grow again loh? Don't know whether it would actually help or not though. Standing even tho its wet and I just came out of the shower. Longest standing strand clocked in a 7cm when I use ruler. Fml. waiting for netzach to fap fap fap to this picture!!! Just want to give thumbs up for Bro GaoXing and Bro JunHong. I've seen some of the hairstyles and products on Slikhaar TV - YouTube and they seem quite nice but I didn't know I could get them in Singapore. But when I found out bro GaoXing is doing MO for those, I decided to test it out. To be honest I was a bit skeptical at first. But after a few days of usage of Gold Digger Hair Clay and Seasalt spray as recommended by bro GaoXing, I am very happy with the result. My hair is those hard to shape type. But with Gold Digger and Seasalt, they're very easy to style and my hair doesn't go out of style from morning till night even for a very humid Singapore. Don't be alarmed, you must be thinking it must be very hard to wash if it lasts this long but to my surprise it is super easy to wash it out. Gold digger clay has a very nice hold with a very nice matte finish. So I'll be getting more if the one that I'm using runs out. The seasalt is from Bro JunHong. After applying the seasalt, it is super easy to style your hair any way you want with Gold Digger Clay. You'll love both the Gold Digger clay and Seasalt. So yea, this my review. If any of you are thinking about getting them, don't think no more. You won't regret. Thanks bro GaoXing and JunHong. stam, gaoxing84 and leejhong like this. Hair permed two weeks ago. First week was great. Now in a mess due to long hair already. Lol. So i placing my hope on Kobayashi tmr. You never take care ijjit? My girlfriend tell me after perm/rebond, 1st month very important, must take care one like apply creams and etc. Got ah. Always put hair cream n treatment. I purposely buy those shampoo for colour/permed hair. I think I should blame my hair for being too straight again. I have nothing but thumbs up! thank you sir for your fine review! Going up the MO thread! Whoops!